Put your data to productive use with HOBOware® Pro software. Plot or export data to spreadsheets to conduct analysis necessary for your project. HOBOware® Pro is easy to set up and its intuitive, point-and-click interface makes it simple to run. This data logging application is compatible with all HOBO data loggers and wireless data nodes. Easy Logger Setup and Readout: HOBOware Pro makes it fast and easy to set up HOBO data loggers for deployment, and to readout the loggers after data has been collected. Settings are configured using simple, intuitive windows. 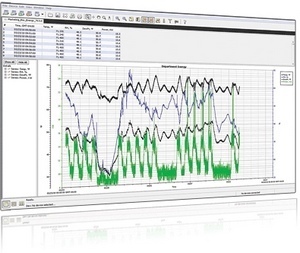 Powerful Graphing and Analysis Tools: HOBOware Pro's powerful graphing and analysis tools allow you to plot, analyze and extract key information from multiple data loggers with a few simple clicks, and quickly create custom graphs to document your data. Data Assistants let you create new data series by combining data recorded by the logger with additional data that you enter before you display the plot. Easy File Management: HOBOware Pro allows for one-click exports to TXT, CSV for XLS file types for use in other programs. The Bulk Export Tool allows you to easily convert large numbers of HOBO files to streamline the export process. Presentation-quality Graphics: With HOBOware Pro, there is no need to rely on third-party presentation software to obtain high-quality graphs and charts for presentations and posters. Note: A USB cable is included with HOBOware Pro. HOBOware data logger software must be purchased one license per computer. See Licence Agreement for more details.